How to manage change? This section provides you with an executive summary of the key subjects covered in this site. 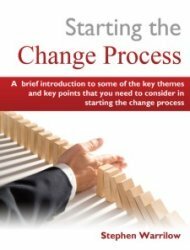 Most, if not all, organisations are experiencing the impacts of change and many could now benefit from the practical knowledge of how to manage change. The content and presentation of the material in this site has universal relevance to organisations of all sizes and can be "scaled up or down" as you feel is appropriate to your organisation. Change can be threatening and disruptive. It can also be very hard work because it usually involves adapting to a new environment, working practices or personal circumstances. Trainee Journalist Anna Kucirkova [who has contributed several articles for this site] has written a good student summary of key themes. 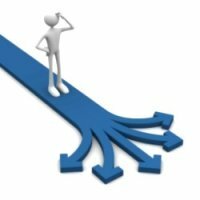 ACAS have created a guide that will help line managers and employers manage major change more effectively by focusing on the personal experience of change and what this can tell us about the kind of support employees need; and also showing how to engage with employees through regular communication and genuine consultation. 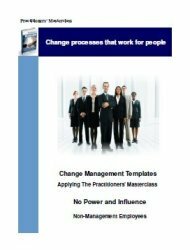 The Government Office for the South West (UK) have produced a very popular booklet "Managing Change" which includes a useful downloadable change management matrix. Change management is a basic skill in which most leaders and managers need to be competent. 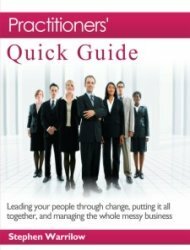 This article takes a look at the basic principles of change management, and provides some tips on how those principles can be applied: ""Five basic principles, and how to apply them""
Any organisational change initiative carries a high chance of not achieving the intended results. Gap - The gap between the "big-picture" vision and a successful implementation which is usually the result of an inadequate understanding of what is involved. Resistance - The "systemic resistance to change" embedded in most organisation's cultures, and the failure to realise this and deal with it. 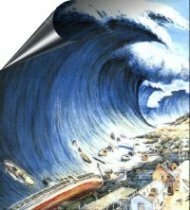 Impact - The failure to grasp the human impact of the organisational change and the imperative of dealing with this. Failure may occur at the "getting it done" level so that the initiative doesn't get off the ground - or doesn't get completed. This is a project level failure. Or it may "get done" but the the initiative still fails because the envisaged and anticipated benefits are not realised. This can best be described as a programme level failure. The root cause of this is can summarised as lack of clarity of purpose, poor communication, the absence of a language or "framing" and the supporting framework to succesfully execute the change initiative. This is what a Programme Management based approach to change is all about and why it so important. More on this below in "Methods of change". We speak of "change management" but in truth change has to be led as well as managed. This is especially true if it is a step change that need to be handled as a separate initiative outside of the constraints of business as usual. The style of leadership that is needed is a leadership that connects with people and that directly addresses what is important to them. The management aspect of how to manage change needs to be much broader based that a typical project led /"task oriented" approach, to address the human factors and deal directly with the commonest causes of failure. This is why we place considerable emphasis on a programme management based approach regarding how to manage change. At the "micro level" - day to day operational level of change management, we need to show people the specifics of what is required of them - and to assist them - especially during the early stages. This site is an informational site and as such is committed to providing you with concise information relating to all aspects of change management - that are practical and that you can retain and use both now and in future. With that in mind, I have recently made several significant enhancements to the site. There are now over 90 documents, reports, schematics, articles and checklists that can be downloaded directly from the relevant page on this site. Every page on this site and every page on linked external sites can now be instantly converted into fully sized PDF downloads for filing, printing or forwarding to colleagues. 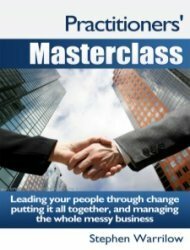 See here if you would like help with any aspects of how to manage change in your organisation.